I am jumping in here quick to share a card I made today for The Paper Player’s Challenge #344 using some scrumptious colors. The stamp set is from Bloom Art stamps called Gerbera Daisies from the garden collection of clear stamps. I have listed the Copic colors used under the photo just in case you are curious. Stunning card. Congrats on your win at Paper Players. So eye catching, love it. Thank you Claire for choosing my card as the headliner. What a great card Crystal – gerberas are a favourite of mine and perfect for these bright colours! I love how your blooms fill the frame – big, bold and beautiful! 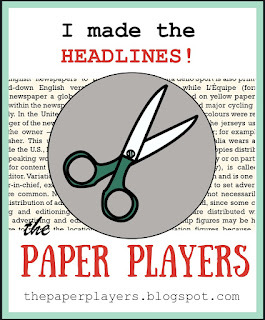 Thanks for joining us over at The Paper Players this week! Thank you Joanne and I agree the colors were perfect for the Gerberas.